According to NIOSH, between 50 and 100 workers die in trenches each year. Protective systems such as sloping, shoring and shielding can help prevent and protect workers from a trench collapse. In the event of an emergency, co-workers should call 911 instead of attempting to perform a trench rescue on their own. Jack Pettyjohn hears that word repeatedly from people who have experienced being trapped in a trench collapse. According to OSHA, the fatality rate for excavation work is 112 percent higher than the rate for general construction. 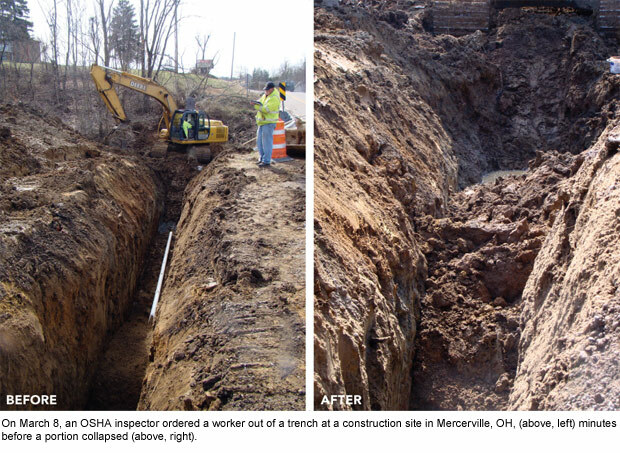 In March, an agency inspector in Ohio removed a worker from a trench just minutes before a collapse occurred that could have buried the worker under 6-7 feet of soil. OSHA said the trench had no protection against cave-ins, despite being deeper than 10 feet. A month later, a compliance officer prevented a similar tragedy in Alabama. Excavations are inherently unstable, whether dug deep or shallow, which makes pre-planning, protective systems and evaluation by a competent person critical to keeping workers safe. OSHA defines a trench as a narrow underground excavation that is deeper than it is wide, and is no wider than 15 feet. Pre-planning is important for addressing factors such as soil, weather, water, traffic and utilities. Workers also need a safe means of entering and exiting the trench, and any excavation in which workers face a potential cave-in must be equipped with one of three protective systems: sloping, shoring or shielding. Sloping, also called benching, involves cutting the walls of the trench back at a specified angle. Shoring systems support the walls of the trench, while a shield or trench box serves to protect the worker in the event of a collapse. Despite the importance of using a protective system, Michael Wright has caught many workers in trenches without one. Wright is president of Safety through Engineering Inc., a safety consulting firm in New Carlisle, OH. “I see commonly that protection is not being used and they typically say ‘because I’m only going to be down there a few minutes,’” he said. In Pettyjohn’s experience, workers often do not perceive trenches to be as dangerous as working at heights or with electricity. Although installing a protective system typically takes minimal time, he said workers may disregard the importance at lesser depths or become complacent. But the danger is clear. Between 50 and 100 workers die in trench collapses each year, according to NIOSH. Most injuries – 75-95 percent – occur in trenches lacking protective systems. View NIOSH's trench safety training. Pettyjohn cited a study that examined 2003 OSHA fatality data and found a protective system was used incorrectly in about one-quarter of trench deaths and, in 12 percent, a protective system was on-site but not used in the trench. That last figure is especially meaningful for Pettyjohn, who recalled helping a local volunteer fire department recover a trench fatality victim in 2004. The victim had been working 8 feet underground without a protective system, even though two trench boxes were at the jobsite. Calling 811 before digging is more than a formality, the simple exercise can save lives. Michael Hein, a professor in the College of Architecture, Design and Construction at Auburn University in Auburn, AL, emphasized the importance of evaluating the soil type and condition before digging. Ground that previously has been disturbed may be more likely to cave in. “But also, once a trench has been opened, the soil’s moisture conditions are constantly changing, and if there’s rain or seepage or anything like that it could encourage a cave-in of the walls of the trench,” Hein said. Hein has developed an online trench safety tutorial based on OSHA standards. To prevent cave-ins, he advised adhering to OSHA requirements to keep the excavated material at least 2 feet away from the edge of the trench. Otherwise, the weight of the spoil pile could trigger a cave-in. Vibrations from heavy equipment also could loosen soil and cause the trench walls to fail. Other trench hazards include accidently striking an underground utility, exposure to toxic fumes, drowning in a flooded trench, and being hit by equipment or falling loads. “The falling suspended load issues ­– it seems like contractors do this on a daily basis and they don’t even identify the hazard anymore,” Wright said. OSHA requires trenches to be inspected by a competent person daily and as conditions change. That person must be able to identify hazards and have the authority to take immediate corrective action. It is important to make sure he or she actually is on-site before and during the project. Pettyjohn said a foreman may appear to be the obvious and easy choice for inspecting trenches, but a foreman may have other duties that require leaving the site. Employees who become used to working without the oversight of a trained person may unknowingly put themselves in danger or cut corners under pressure, he warned. Depending on the project, trench competence alone may not be enough. Wright pointed out that trench work also may involve scaffolding, fall protection or lockout/tagout, each of which requires different expertise. “There’s so many elements, so many different requirements that are standalone requirements that a competent person really has to be well-trained to pick up on,” Wright said. In his opinion, a breakdown in safety often occurs because employers miss out on a key element of OSHA’s definition of a competent person – the ability to recognize both existing and predictable hazards. Read more on OSHA's definition of a "competent person"
When a trench collapses or a worker passes out in a trench, a co-worker’s first instinct may be to rush down and help. Although well-intentioned, that could prove to be a fatal mistake. “The chances are very good that you may likewise become a victim,” Pettyjohn said. Instead of trying to perform a rescue, he recommended calling 911 and waiting for emergency responders to arrive and secure the trench. Pettyjohn knows of many horrific trench incidents, but he also knows the flip side – top-notch trench work is possible on sites where employers budget for necessary safety equipment and require employees to follow safety procedures.